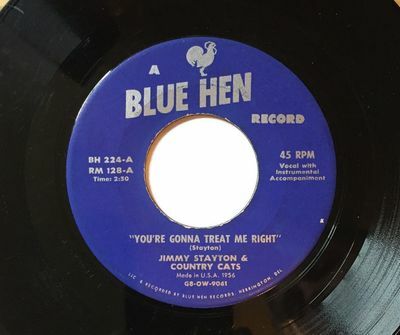 Title: "You’re Gonna Treat Me Right” / “Midnight Blues"
Note: b-side also credits “MORTON WALKER” (Marker). Label: BLUE HEN RECORDS (Harrington, Delaware). # BH 224. Comments: Holy grail rockabilly rarity featuring JIMMY STAYTON (guitar and vocals), MORT MARKER (guitar), and PATSY SAUNDERS (drums). VINYL: Condition is VG with most of the original gloss remaining. There are some hairline scuffs that produce some occasional light tics especially in the soft passages, but the overall fidelity is quite strong and the listening experience is enjoyable as you can hear in the accompanying sound clips. This is early roots rockabilly at its finest! Labels display some rubbing but are otherwise clean with no writing, stickers, or other flaws. This is rockabilly, meant to be enjoyed! As always, your satisfaction is fully guaranteed. NOTE: In order to give everyone a fair chance, we do not end auctions early. Guaranteed to be original and authentic pressing from 1956. We do not sell bootlegs or modern reissues. This is the real deal! We are happy to combine purchases to minimize shipping cost. FAST, FRIENDLY WORLDWIDE SHIPPING: DIRECT from me to you. WE DO NOT use an intermediary shipping service - NO middleman, NO hassle, NO unpleasant surprises. Thank you for viewing our auction, and good luck with your bids! Proudly serving the worldwide eBay community since 1998!